Whip up this keto cookies ‘n cream milkshake in just 15 minutes, for a killer fat bomb treat or low carb dessert! 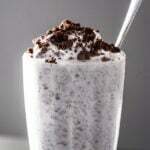 No-bake ‘oreo cookie’ crumbs included! 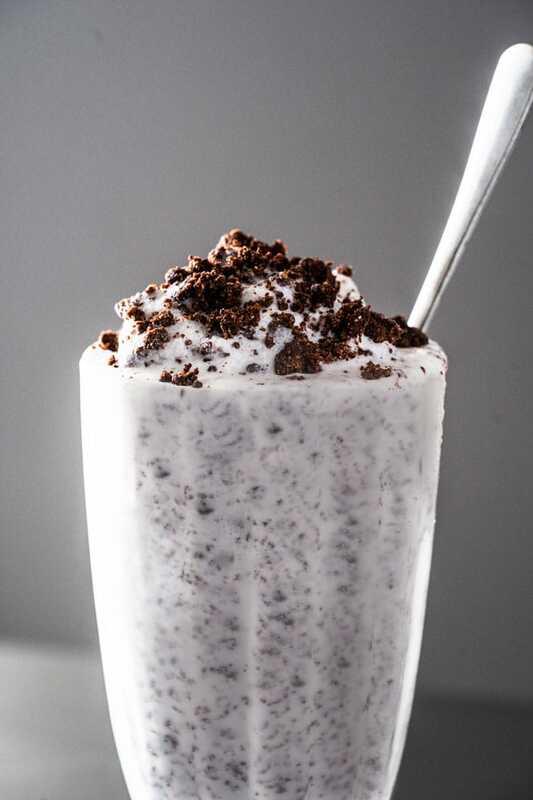 I feel like this keto cookies and cream milkshake needs (very!) little introduction. 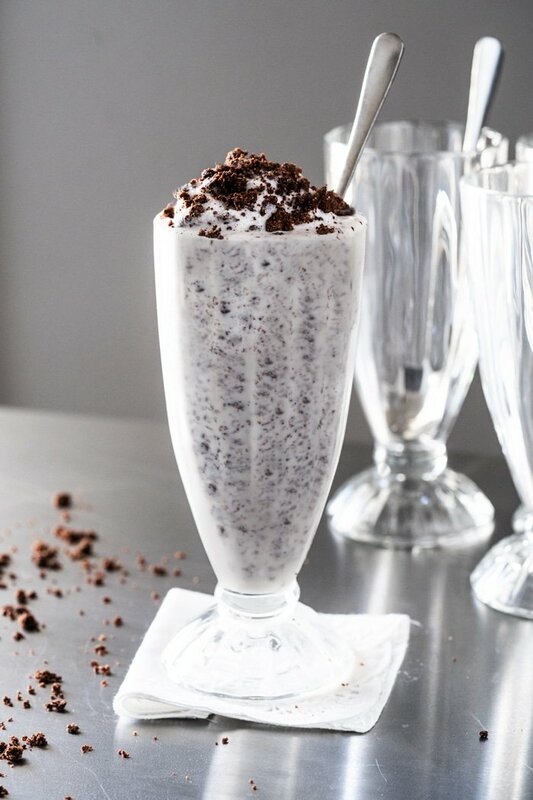 You know what to expect: a delicious vanilla ice cream shake, blended up with Oreo cookie crumbs for those chocolate hues (and incredible texture!). For the ice cream shake I’m giving you two options: one with actual ice cream and a second one with a nifty hack (a bit less creamy, but so yum!). And what about said cookie crumbs, you’re probably asking! Now, in all honesty and despite how much I love baking, I wasn’t about to bake a whole batch of cookies just to blend them up! So I followed the route of our famous cookies ‘n cream fat bombs with an ‘instant’ version that totally does the trick. Read on! It’s super simple. All you need to do for the ‘cookies’ is toast up some almond flour and mix in some cocoa, sweetener and butter. Once you get it all frozen up, you get that awesome mouthfeel of soaked cookie crumbs. Fairly instant, and no baking required. 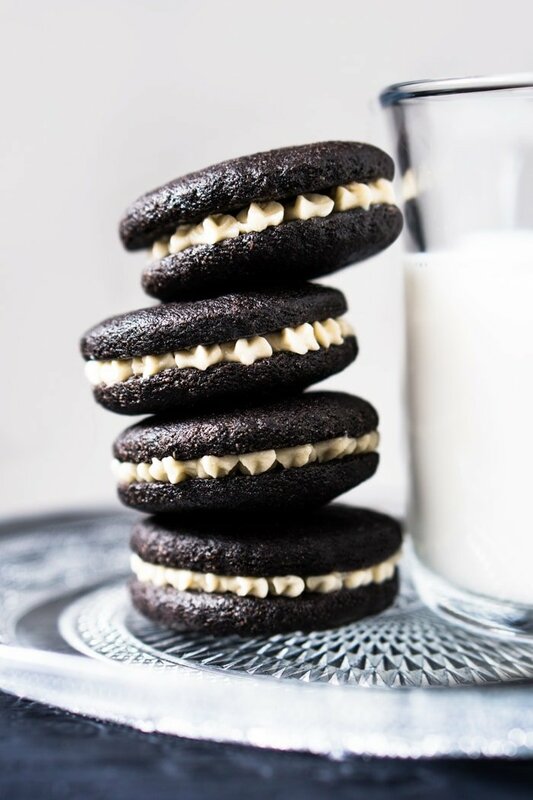 Though, I mean, you can always go ahead and bake a batch of our gluten free & keto Oreos. They’re ace, and come highly recommended! Just do yourself the pleasure of eating them whole. You can make the keto milkshake with some actual ice cream or hack it! 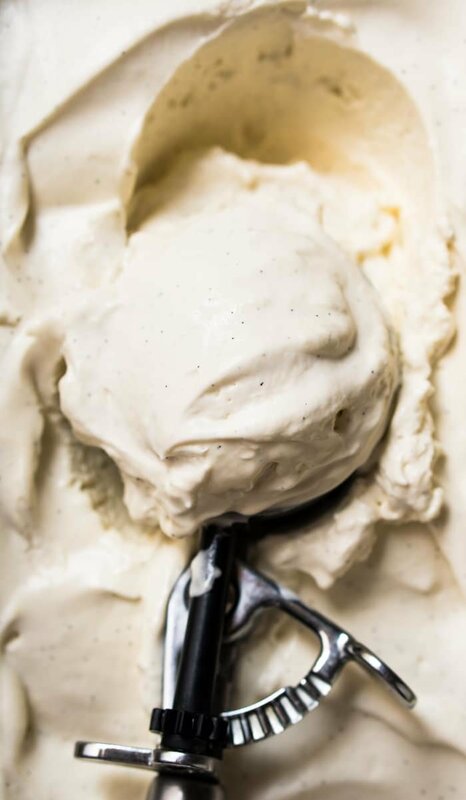 Now, with some actual ice cream, think our no-churn vanilla ice cream, you’ll get a legit milkshake through and through. Also, do note there are a few brands now doing solid keto ice creams (I like Rebel, totally unsponsored or affiliated- just happy to recommend!). Alternatively, you can make a ‘mock milkshake’ by blending some full-fat coconut milk (or heavy cream) with vanilla extract, a sweetener and a handful of ice. Less creamy, but utterly delicious once you get in the chocolate cookie crumbs! Alternative numero tres, is that you whip up our keto chocolate milkshake for some double chocolate action! The avocado in that one ensures an unbelievably creamy texture, no ice cream required. In terms of coconut milk brands, I’ve recently discovered Roland’s Organic Milk and I’m in love. It’s sooo creamy even right of the can, and has a much milder flavor than any other brand I’ve tried. Honestly cannot recommend it enough (can you tell I’m obsessed?!). Plus, it whips beautifully. Cocoa or cacao? Both work great, just know that quality really matters here. My favorite will forever be the Dutch-processed alkaline cocoa Valrhona, known to be one of (if not the) best cocoas in the world (also higher fat and lower carbs than many brands out there). But feel free to use a raw cacao powder (arguably more nutritional perks here), though keep in mind that your cookie crumbs will be lighter in color and more reddish in hue. Both are well and good, as long as they’re unsweetened. You can pretty much use whatever sweetener floats your boat. But it must be powdered. I’ve tested them with Lakanto Golden, xylitol (non-corn though to avoid tummy troubles!) and allulose (just be sure to add 30% more as it’s less sweet!). Or you can always grab a bag of Powdered Lakanto (just keep in mind its twice as sweet…. or even go for pure monkfruit extract (love Lakanto’s!). Do note that I always avoid stevia with chocolate as it gives a suuuper bitter aftertaste (at least for some peeps, myself included!). 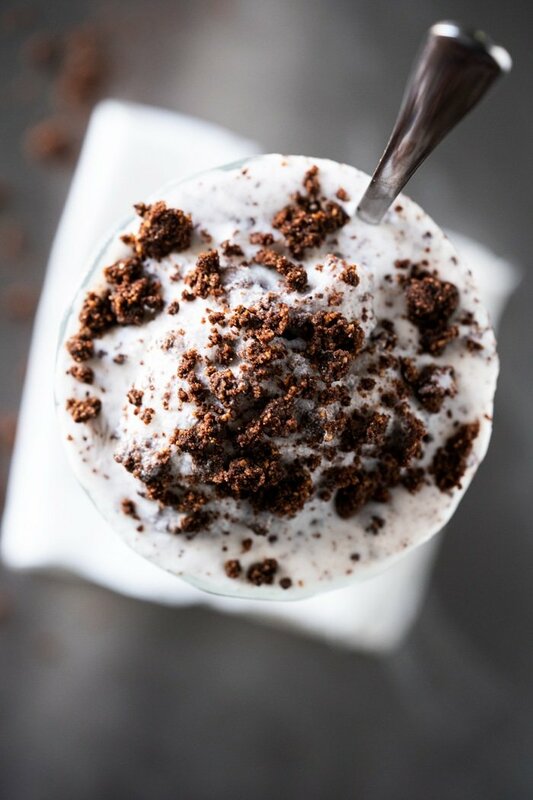 Whip up this keto cookies 'n cream milkshake in just 15 minutes, for a killer fat bomb treat or low carb dessert! No-bake 'oreo cookie' crumbs included! Lightly toast almond flour in a dry skillet or pan over medium heat, until fully golden and fragrant (2-4 minutes). This is very important taste-wise, so don't skip! Transfer toasted almond flour to a small bowl, and mix in cocoa, sweetener to taste, coffee (optional) and salt. Add in butter, mix until thoroughly combined. Place both in the freezer while you make the milkshake. Add the vanilla ice cream and milk of choice to a blender and run until just combined. Add half of the cookie crumb mixture and pulse for a few seconds (don't want to completely blend them in!). Mix in the remaining crumbs (I always like having larger chunks!) and enjoy right away! Add all ingredients, aside from the ice, to a blender and run until smooth. Taste for sweetness, add the ice and pulse until thick. Be careful not to over do it, or you'll lose coldness very quickly! Add half of the cookie crumb mixture and pulse for a few seconds (don't want to completely blend them in!). Mix in the remaining crumbs (I always like having larger chunks!) and enjoy right away! *Please see section on sweeteners for deets and possible subs. And if using xylitol, make sure to be careful if you have a pup around the house, as it’s highly toxic to the little guys! **In terms of coconut milk brands, I’ve recently discovered Roland’s Organic Milk and I’m in love. It’s sooo creamy even right of the can, and has a much milder flavor than any other brand I’ve tried. Honestly cannot recommend it enough (can you tell I’m obsessed?!). Plus, it whips beautifully. Please note that nutrition facts were estimated per milkshake, using our no-churn vanilla ice cream. Thank you for posting this!!!!!! Super excited to try this! I’m currently making your tortilla dough for dinner tonight but we will need dessert 😂! Will the cookie crumbs taste good with sunflower instead of almond or will the taste be off? Hi AB! Awesome on the tortillas! Would you be able to do pecans (or even hazelnuts?!) instead? Sunflower will definitely work, but I’m thinking that those two other nuts will be more complimentary taste wise. You can just grind them up, doesn’t have to be ‘super fine’ to work here 😉 xo! OH MY STARS!!! It’s about to be an awesome summer!!! And to think, people around me at work think I’m deprived because I don’t participate in their potlucks. Little do they know this is the kind of pleasure I find in my kitchen! Lol right?!! 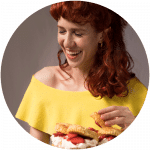 When people as me ‘what can you actually eat?’ I just make them scroll through the blog 😂!! Hope you love Lisa and big kiss, always a pleasure to read you! Hi Paola! 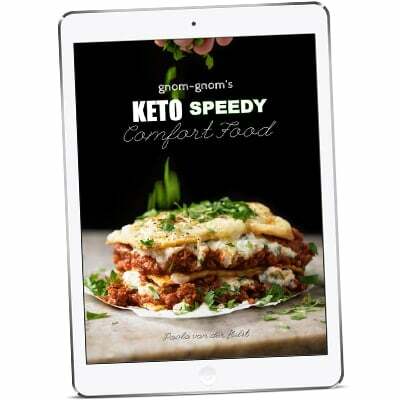 I love every single recipe I have tried of yours! I’m in love and envious at the same time. LOL! I have a quick question on this recipe. In the oreo crumb instructions, number 2, it says to put “both” in the freezer. Is that a typo or am I missing a step? Thank you so much! LOL Tonia! You’re so sweet 😂! And yup, its definitely a typo- thanks so much for the heads up! Its just meant to read to pop it in the freezer while you prepare the shake 😉 xo!! Made the non ice cream version. So yummy! Thank you so much! Susan that’s so wonderful to hear!! So awesome you whipped it up already! Looks amazing can’t wait to try! HOW are you always reading my mind Paola?!! I’m whipping this up tonight!!! Lol! Hope you love Casey! xo!